Aircraft structural icing is very hazardous to airplanes. Even a small layer of frost can cause a significant change in the shape of the airfoil and a corresponding change in performance characteristics. De-icing your aircraft is often a necessary part of cold weather flying, and you should know how to do it right. 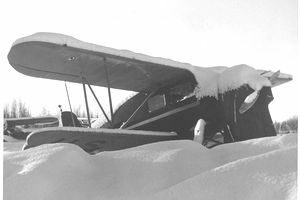 The FAA and all major operators follow a “clean airplane” concept in which an airplane is prohibited from taking off with any ice or frost on the wings at all. While Part 91, which regulates general aviation operations, doesn’t specifically address icing for general aviation pilots, all pilots are required to conduct safe flight operations, and all pilots should avoid taking off in an aircraft with ice or frost on it. Putting your airplane in the hangar will make your life much easier during the winter. Not everyone has access to a hangar, but if you do, make sure you utilize it. If you hangar your aircraft overnight before a morning flight, you’ll save a lot of time spraying your airplane down or waiting for a de-icing crew to show up, you’ll have a clean and dry airplane, and you’ll be a lot warmer. If you can't or don’t want to budget for hangar rental fees, ask the FBO or hangar owner if you can pay a lower fee to hangar it just for a few hours prior to a flight. One of the only options that general aviation pilots have when it comes to snow and frost removal is to brush the snow off physically. Pilots should always use a soft-bristled brush made for aircraft. Other types of brushes will scratch the surface of the airplane. Pouring warm water over the aircraft surface can melt frost. But be careful that the water doesn't refreeze. Use a towel to dry the water as you go. De-icing and anti-icing fluids can be costly, but there are a few inexpensive options, too. Approved substances for de-icing aircraft include glycol (commonly in the form of propylene, ethylene and diethylene glycol), water, corrosion inhibitors, wetting agents, and dye, which is used to determine the type of fluid easily. The pilot’s aircraft flight manual should be consulted to determine what fluids are acceptable for use. While some fluids like rubbing alcohol and automobile windshield wiper fluid can work and are in use by many pilots, they’re not approved for use on aircraft, and you may risk damage to your airplane. Small aircraft should use Type I or III fluid, which is made for aircraft with a slower rotation speed. Type I fluid is the most commonly used, has no minimum rotation speed restriction, and can provide about 45 minutes of ice protection on the ground when applied by a knowledgeable person. If a hand-held sprayer is used, the effective time is decreased. Type I fluid is orange. Type III fluid is meant for aircraft with a rotation speed of at least 60 knots. Type III fluid is yellow-green in color. Pilots should be sure they don’t spray de-icing fluid into any critical "no-spray" areas on the aircraft, such as inside of the engine inlet, on the windshield or in the pitot tube. A list of no-spray areas can be found in the aircraft flight manual. Heated air can be used for engine inlets and other iced-over areas if necessary. Winter can be a great time for flying, but if a hangar isn’t an option, make sure you to have some de-icing fluid on hand, and use it liberally. It’s a lot easier to get ice off your aircraft while it’s on the ground than in the air, and you’ll be able to relax knowing that your airplane will perform as usual during your flight.